It’s been a hectic couple of weeks. Long days at the computer to meet a series of deadlines. And then, to take advantage of the unusually dry weather lately, getting outside on the weekends and going on hikes. 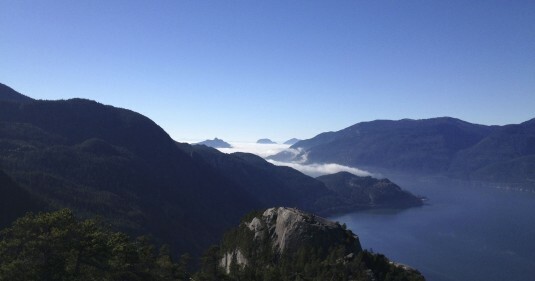 One hike in particular, the Stawamus Chief, has a certain appeal to Bob. It’s a challenging hike, a steady 600 meter elevation climb, and the views are spectacular at the top on a clear day. So while I tend to seek out the flattest running routes possible, the view at the top was motivating enough to make me a (mostly) enthusiastic hiking companion. Perhaps it’s all the fresh mountain air, but I was craving salads of the heartier variety last week. And I wanted to do something different with kale. My typical m.o. with kale is to sauté it with some garlic, olive oil, salt and pepper, and squeeze in some fresh lemon juice just before serving it as a side dish. Not terribly inventive, I know, but it’s easy and I like it a lot. But this week I felt like a change. 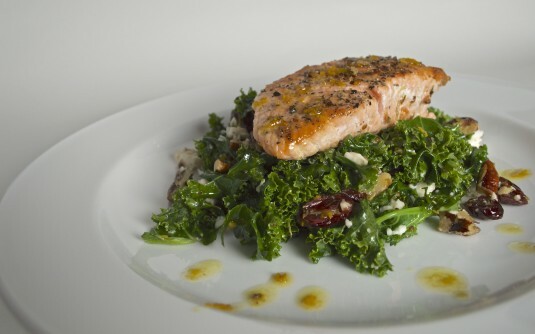 How about kale salad? A raised eyebrow and slight puzzled look from Bob. (Not unlike my reaction when he suggested we hike the Chief for the third week in a row.) Umm, you’re going to cook it though, right? It’s true, kale is a robust little green. More so when it’s raw. Several recipes marinate or massage the kale to soften it for salads, but I quickly blanched it in the microwave for 40 seconds. That was enough to tame it into a perfectly acceptable, yet still hearty, salad green. The orange vinaigrette is a citrus-y, less tart variation of my squeeze of lemon, and it complements the kale surprisingly well. This salad has lots going for it: Healthy, easy and quick, can be made ahead of time, keeps well in the fridge for a few days. Most importantly, for me, it delivered the satisfying, substantial texture I was after, with the zing of bright citrus to lift my taste buds up. And all without having to hike for two hours up and down a mountain trail. Yes! A simple, make-ahead salad that makes a great main course salad or accompaniment to grilled poultry or fish. For a Paleo version, omit the feta cheese and cut down on the dried cranberries (or substitute some fresh berries or orange slices). 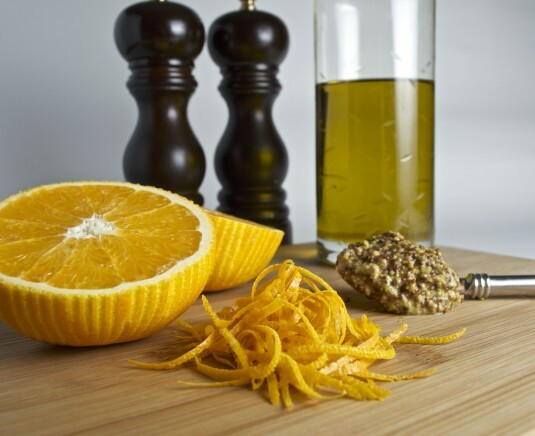 In a small bowl, combine mustard, orange zest and orange juice. Whisk in olive oil and season to taste with salt and pepper. Cover bowl of kale and microwave for 30-40 seconds, or until slightly wilted. Remove any excess water from the kale by draining it or moving the leaves to a new bowl. Add half the vinaigrette (2 tablespoons) and toss with the kale. Add more vinaigrette if desired. 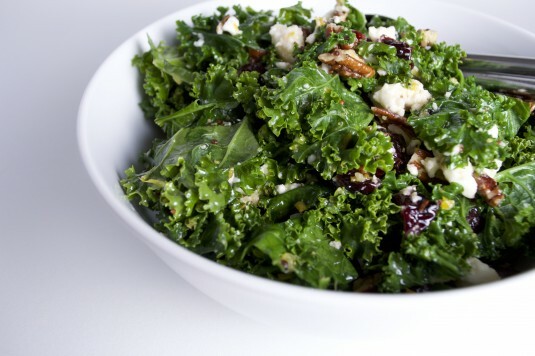 Add cranberries, pecans, and feta cheese to the kale, and toss until evenly combined.